These fleeting newborn details last just a moment in time! Their baby soft hair, tiny fingers, their precious smile - a newborn session in my studio is the perfect way to slow down time and document all those important details of your little babe. During our time together, I’ll focus on the details you love most about your baby, while adding layers of textures and earthy inspired props. My home studio is located in Corpus Christi, Texas. It is equipped with posed newborn portion as well as a lifestyle portion to capture you and your family with your newest babe! 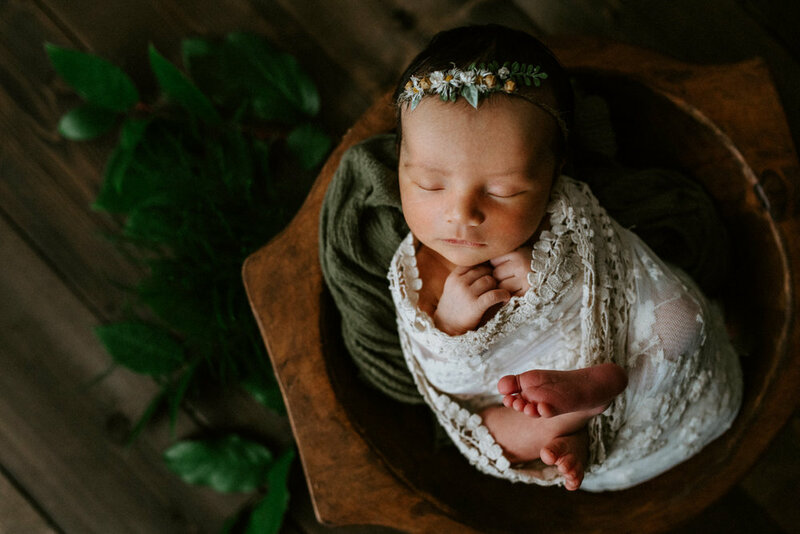 Studio sessions include Kerlyn’s artistic vision and creative direction, a pre-consultation via email or telephone, access to client wardrobe, and exclusive newborn guide with tips to prepare for your session! Your photos will be delivered in a private online gallery, where you can view, download, and order prints. My collections are all-inclusive and include digital photos with printing rights. I also offer professional prints, canvases, and leather bound albums as add ons - uniquely made and delivered! Due to the unpredictable nature of birth, I only take on a select number of newborn sessions a month. The best time to book your newborn session is when you are entering your second trimester! Upon booking, I will make note of your due date on my calendar and keep dates open around that time. I ask that you please contact me within 48 hours of birth to guarantee your session on my calendar. How old does my baby need to be to do a newborn session? The best time to photograph newborns is from 3-10 days! This ensures that they are still in their sleepy phase, which will make them easier to wrap or pose. Your gallery will sent via a private online gallery four weeks from your session date! I love posting sneak peeks, so be sure to follow me on Instagram (@kerlynvangelderphotography) and on Facebook so I am able to tag you in your photos! Your print images, canvases, and albums take 3-6 weeks of delivery after your balance has been paid and photos have been chosen! I offer several all-inclusive digital collections as well as prints, canvases, and albums that can be added on to any order. I am aware that in this day and age the convenience of digital copies so every collection comes with printing rights. My newborn studio is located in Corpus Christi, Texas! A week before your session you will be sent the exact address with your newborn info packet! No! At my studio you will have exclusive use to my newborn outfits, wraps, accessories, and props! I offer a full range of handmade props, sourced from around the world. I love fresh flowers, earthy tones, layers + textures, vintage inspired outfits, and one-of-a-kind pieces that will make your photos unique! Upon booking I will send over a questionnaire that will get some details about your nursery theme. Prior to your session, I will put together neutral + earthy tones setups that are found throughout my work, as well as setups that may match your theme. You’ll be able to relax and leave all the hard work up to me! Do you shoot natural light? Yes, I use natural light throughout all my work! To create the emotive photos you are drawn to and to have a cohesive style for every session you book. For studio newborn sessions, I typically shoot in the afternoon when my studio receives the most light! This is one of my favorite parts about planning your session! Earthy tones, neutral colors and prints all work well for any type of session. I always recommend finding something special, it may already be in your closet. I also offer styling and curated pieces in my client wardrobe! I'll help you choose something that will compliment your studio session! Once book your session, I'll send you my session guide with more “What to Wear” information! Due to the time constraint on newborn sessions (3-10 days after birth), I only reschedule newborn sessions due to a sickness in your family. Please reach out to me as soon as possible!